Save the Hawaiian Monk Seal! Our Eco Friendly Valentine’s Gifts that Give Back Guide features sustainable gifts that are good for the planet and perfect for your loved ones who are - or aspire to be - environmentally savvy. Not only are you saving the planet with these green gifts, but each purchase supports medical care for our patients, which has helped us to rescue 23,000 marine mammals since 1975. For delivery before Valentine’s Day, order online by February 5. Shopping at the last minute? 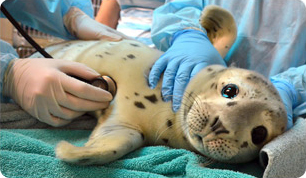 Purchase an Adopt-a-Seal® and print at home! If you just love love, this Adopt-a-Seal® is the perfect gift that gives back. When you symbolically adopt southern sea otters Langly & Sprout (pen-mates that became instant companions!) your purchase will provide the food and medical care our sick and injured patients need in order to return to their ocean home. You can personalize the adoption certificate that features Langly & Sprout’s photo and their story. From dolphins to seals to sea otters and sea lions, choose from one of our Adopt-a-Seal® success stories here. If jewelry is your loved one’s preferred gift, these delicately handcrafted earrings are the perfect complement to this limited-edition 4ocean bracelet. Both pieces are made from recycled glass, ensuring that you’re outfitting your loved one with the finest in recycled jewelry. This to-go set of bamboo utensils includes a fork, knife, spoon and chopsticks and comes in a convenient case (five different colors!) made from recycled plastic bottles. You’ll find this eco friendly gift is perfect for anyone who loves restaurant leftovers or takes meals on-the-go. You’ll feel good knowing that you’re keeping single-use plastic utensils out of landfills! Practical and easy to bring along, this shopping bag is made from 100% recycled plastic bottles and the carabiner is 78% recycled aluminum, making it the perfect green gift. When not in use, it easily stuffs into its built-in pouch and can clip to belt-loops, keys, backpacks or purses. Now the shopper in your life can shop till they drop knowing they are helping eliminate hundreds of plastic bags from the ocean and landfills. Help the straw-lover in your life stop sucking! Americans use 500 million plastic straws each day and many end up in our beautiful yet fragile ocean. 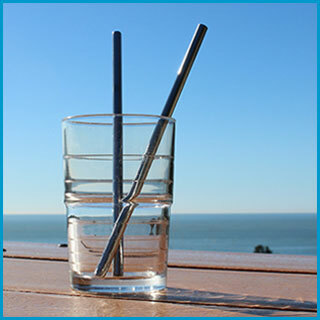 These durable BPA-free stainless-steel straws are easy to carry and easy to clean. Perfect for cold drinks, smoothies and even cocktails! You will feel proud of yourself when you gift these reusable straws because you are helping reduce plastic pollution that harms ocean life. These sell out fast so order yours before they’re gone! For the hiker, walker, runner and anyone else on the go, this USA-made, BPA-free 24-ounce aluminum water bottle will keep anyone hydrated in style throughout the day. 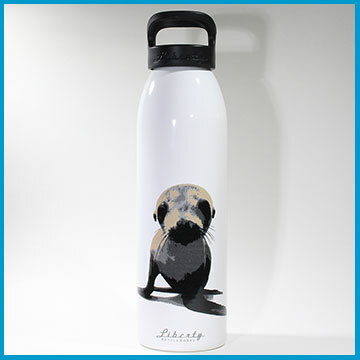 Show your love for The Marine Mammal Center with this water bottle that features California sea lion pup Notebook. An adorable Adopt-a-Seal® package with plush and book. $60 + Free Shipping! Help to save seals and get a book, seal plush and personalized adoption certificate with this adorable gift that gives back. The special kid in your life will love reading about the patient they adopted and playing along with their new plush sea lion in this popular package. A gift and eCard in their honor. Starting at $5 + Free Shipping! The perfect gift that gives back for someone who doesn’t need more stuff, a gift to The Marine Mammal Center in honor of your loved one has a big impact on ocean conservation. Send a personalized eCard with your donation and let them know they gave a second chance to marine mammals. Your eCard can be sent immediately or on a specific date. A purchase of any of our Eco Friendly Valentine’s Gifts that Give Back will help to support our mission of ocean conservation through marine mammal rescue and rehabilitation, scientific research, and education. Browse all of our gifts that give back to help save seals, sea otters, sea lions and other marine animals.